Hanoi. The bustling and vibrant city in North Vietnam. A city that conjures up images of red lanterns, golden sunsets and winding alleyways filled with aromas and bonhomie. Hanoi is a city that steals thousands of grown-up hearts. It’s also a challenging city to visit with children. 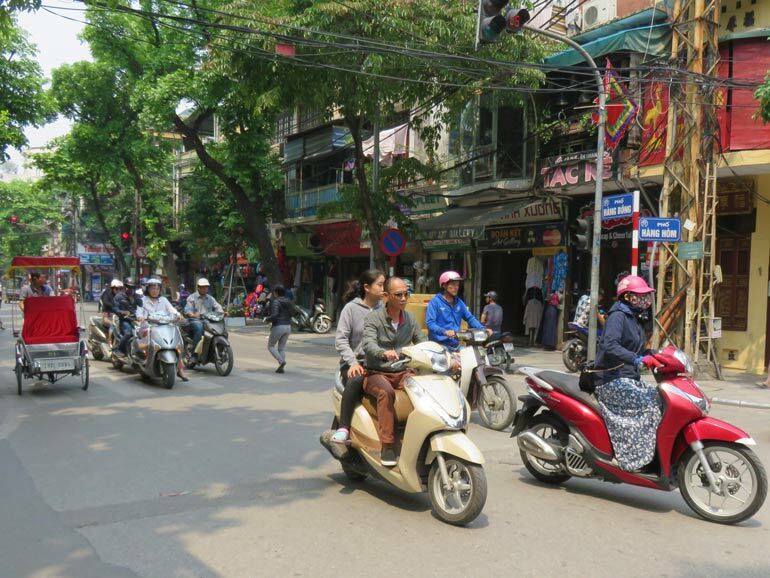 The constant sea of traffic as motorbikes, bicycles and car jostle for space on the narrow streets makes simply crossing to the other side of the road in Old Town Hanoi a nightmarish experience. The cracked pavements are crowded with chairs and tables as locals cook and eat on the streets. Using a stroller or minding a dawdling toddler is near impossible. To add to this, many of the best tourist attractions, like the Hoa Lo Prison Museum, are totally unsuitable for families. But don’t let that put you off visiting. 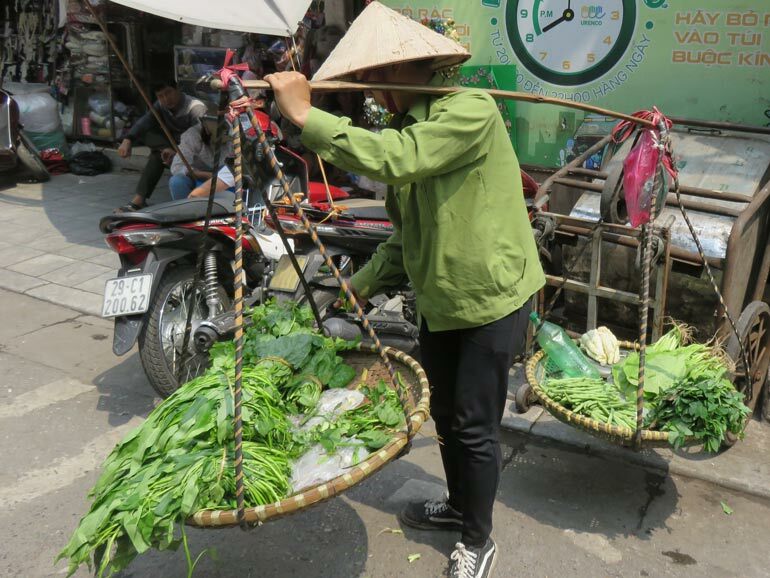 Hanoi is a fascinating city with world-class cultural and historical sights. If you’re in Vietnam, even with young children, you shouldn’t miss it. Let us show you how you can spend a perfect (and almost relaxing) 2 days in Hanoi even with young children. We’ve been there. We’ve tried-and-tested the city with our two energetic children. Through trial and error, we found some great ways to make a visit to Hanoi child-friendly and enjoyable for the whole family. By the end of our trip, we even came up with 15 ways to make visiting Hanoi with a toddler less stressful. Wake up early and head straight to the Old Town. The locals will already be up and out but you can explore before the other tourists arrive. Grab a bowl of pho for breakfast. Pho is a delicious clear broth made with rice noodles, herbs and meat. A very healthy start to the day and one that even your little ones might like. Old Town, Hanoi is the historic, commercial and cultural heart of Hanoi. Vibrant shops still exist in the narrow heritage buildings. Each street of shops selling a particular type of merchandise. My kids loved walking along ‘toy shop’ street! Dotted in between the busy shops and cafes, you will find temples, such as the famous Bach Ma Temple, and restored heritage houses to visit. Young children may find the crowded streets and noise in the Old Town a little overwhelming. To make the whole experience a little easier with children, two possibilities are taking a rickshaw or an electric bus to explore this part of the city. With two under-fives, we opted for an electric bus which gave us a private tour of the Old Town without the hassle of crossing the roads or little legs getting tired. The electric bus tours start and finish at the Northern end of Hoan Kiem Lake. So when you hop off, it’s a great time to explore the gardens around the lake. Older children might be up for a walk around the entire lake, younger ones will enjoy a rest and a cold drink. There’s a bright red bridge over to the island in the middle of the lake housing Ngoc Son Temple. A great photo opportunity. The temple is open to visitors for a small fee. 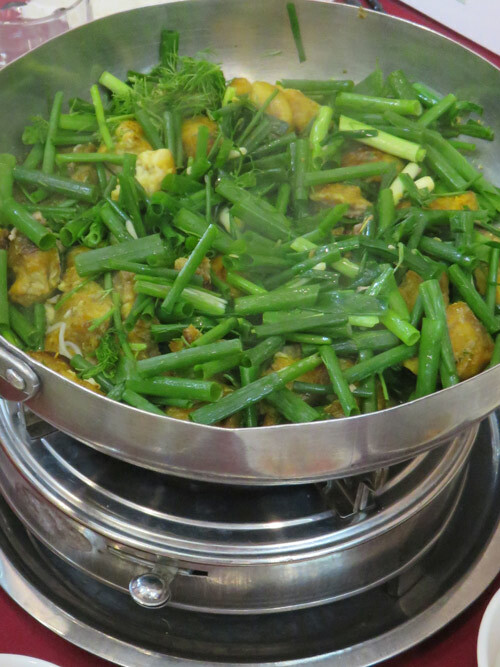 By now it’s almost lunch time and today make time to try Cha Ca, a traditional Northern Vietnamese dish. One of my favourite dishes in the world. Cha Ca is white fish marinated in turmeric cooked with copious amounts of dill served with noodles or rice paper, peanuts and green leaves. It’s fresh, healthy and delicious. It’s a great meal to eat with fussy children as it’s cooked at the table on a little gas stove meaning you can ‘separate’ ingredients easily. It’s also not spicy at all. There’s even a street dedicated to restaurants serving Cha Ca. Unsurprisingly, it’s called Cha Ca Street! 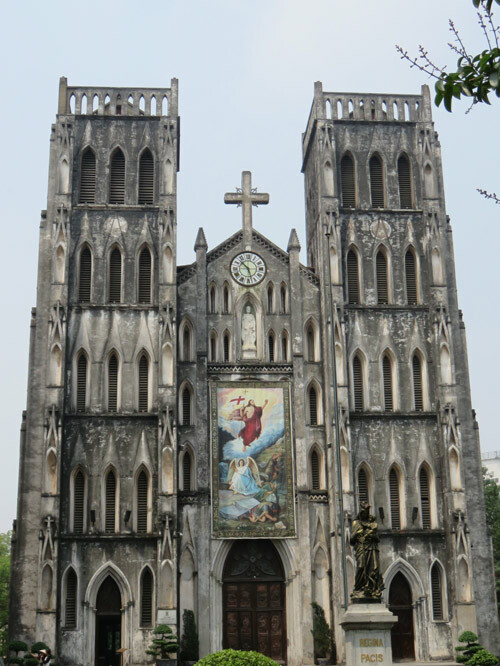 This afternoon, visit the Hoan Kiem District just west of Hoan Kiem Lake and take some holiday snaps outside the atmospheric St Joseph’s Cathedral. There are lots of wonderful craft shops and boutiques around this area if you’re looking for souvenirs. Head south to visit the Vietnamese Women’s Museum. An outstanding museum dedicated to the lives of the women of Vietnam past and present. There’s a small children’s room downstairs and a few interactive exhibits. A little further east is the National Museum of Vietnamese History if you have time for another museum. Rest your feet at one of the wonderful coffee shops around Hanoi. Bustling with coffee aromas, noise and smoke the cafes aren’t exactly cosy. Many sell amazing and very cheap ice-cream and desserts though if the little ones need a treat. After a reviving Vietnamese coffee (made with condensed milk and incredibly strong coffee), meander down into the French Quarter. Here the buildings reflect the colonial era with upmarket hotels, foreign embassies and government offices. The sidewalks in this part of town are wide grandiose boulevards. It’s a much easier place to walk with a stroller if you have one. As you’d expect there are many great restaurants and classy cafes in this area. Don’t walk too fast though because the appeal of Hanoi is the street-life. Locals eat, socialise and virtually live on the streets. One of our highlights was my husband getting his head cut by a barber right on the sidewalk in the French Quarter! If your children are up for a late night, visit the Water Puppet theatre after dinner. 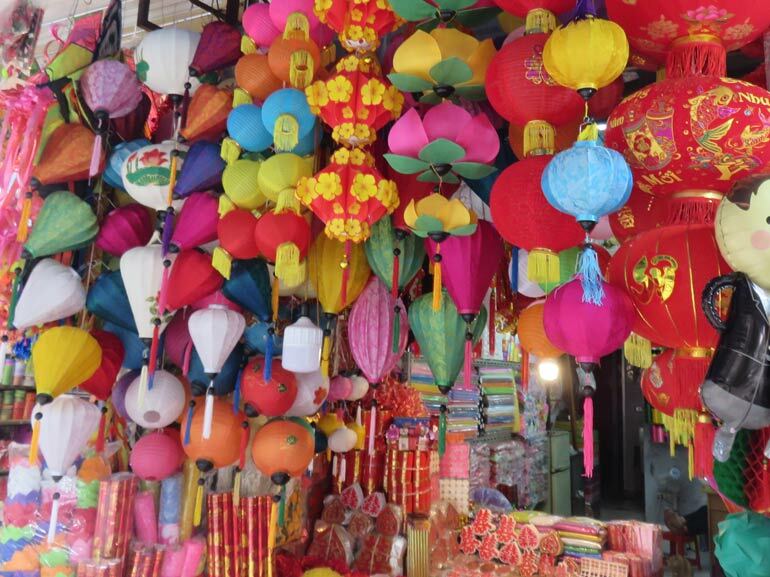 This traditional Vietnamese artform is a family-friendly highlight of Hanoi. 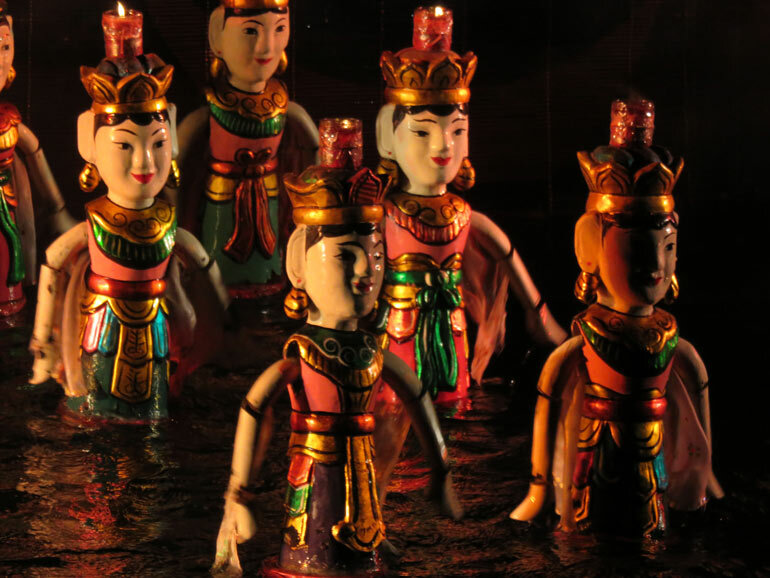 The Thang Long Water Puppet Theatre is located at the Northern shore of Hoan Kiem Lake. The shows are a memorising display of atmospheric music, lighting and scenery. Although of course the stars of the show are the puppeteers who control puppets both by strings and underwater. Everyone from toddlers to teenagers will be captivated. 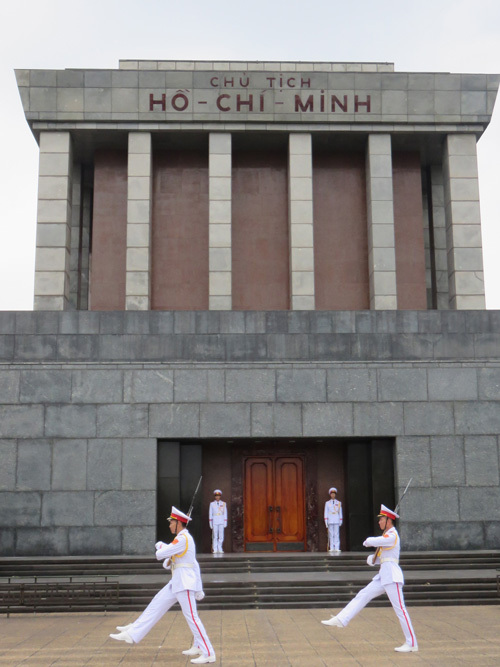 Start the day with a visit to Ho Chi Minh’s Mausoleum. Whether or not you decide to join the queues to pay their respects to the former leader embalmed body,it’s still worth a visit. The gardens surrounding the complex offer a great place for kids to run around. Watch the Changing of the Guards and ogle the huge, marble buildings built in memory of Ho Chi Minh. If you haven’t been travelling around Southeast Asia for a while and still have room left for temples, then The Temple of Literature is a must. This spacious complex offers beautiful well-preserved Vietnamese architecture combined with historical artefacts and plenty of space to relax away from the city crowds. The temple is dedicated to Confucius and you can spot a statue of him next to the pond. For lunch today, try a Banh Mi. Whilst it may just look like an ordinary baguette sandwich, a Banh Mi is so much more. Filled with pickled vegetables and pork, chicken or tofu, these are unforgettably tasty sandwiches. You can buy them in most cafes or from street vendors. If you fancy an excursion out of the city centre, pop in a taxi to The Museum of Ethnology which highly recommended by families travelling with young children to Hanoi. Here, children are explore (i.e. climb in and out of and run round) traditional Vietnamese dwellings.Many made from wood and bamboo. It’s about 25 minutes drive from the city centre. If everyone is feeling a bit tired then perhaps make time for a siesta. In the evening, head down to Ho Tay (or West Lake). Have a walk around the lake with the locals as dusk falls and then have dinner at one of the many seafood restaurants at the Southern end of the lake. If you’d like to take in the view at night, you can buy a ticket to go up the nearby Lotte Tower and watch as night falls over this incredibly buzzing and lively Asian city. 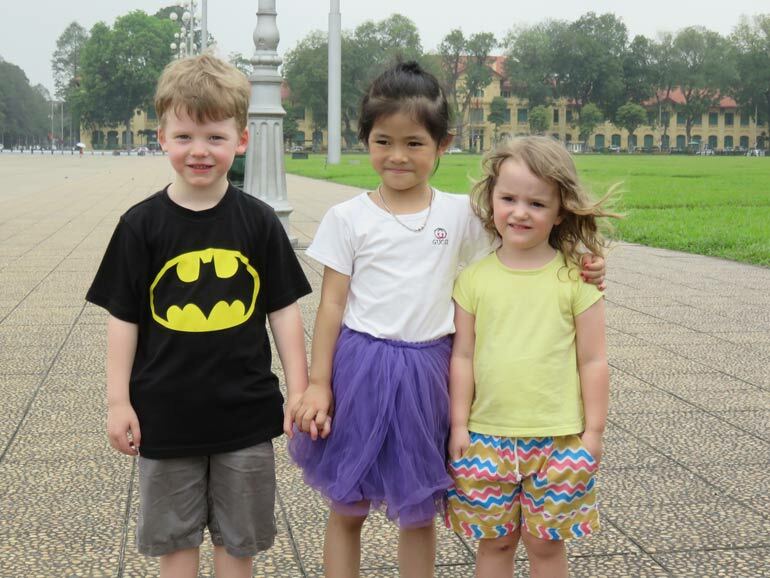 Hanoi can be an overwhelming and chaotic city for young children. There’s just so much going on. Try and factor in down-time and siestas. Pick a hotel with a swimming pool if you can. We decided to book small Airbnb apartments which didn’t leave the children much room for playing and letting off steam. If you’re travelling with a baby or toddler, consider bringing a baby carrier or sling. The sidewalks are too crowded and cracked to use a stroller safely. Hanoi has an international airport that flies to many destinations around Southeast Asia and the world. Most nationalities will need to apply online for tourist visas prior to arriving. Trains and buses also arrive into Hanoi from Southern Vietnam. It is possible to travel overland from Southern China into Vietnam if you have the right visa and use an official crossing. Where to go after Hanoi? Most families don’t just fly to Hanoi. Vietnam is an amazing family travel destination. Within a relatively short distance of Hanoi is the world-famous Halong Bay. A beautiful bay of 3000 islands where families with older children may want to take an multi-day cruise to explore this mysterious and beautiful landscape. With children of all ages, we highly recommend a train ride down to Ninh Binh. About 2 hours south of Hanoi, the countryside around Ninh Binh is a world away from the pollution, hustle and chaos in Hanoi. Our young children loved exploring the ancient temples, dark caves and paddy fields. Book accommodation with child-size bikes and you can even explore the area by bicycle. 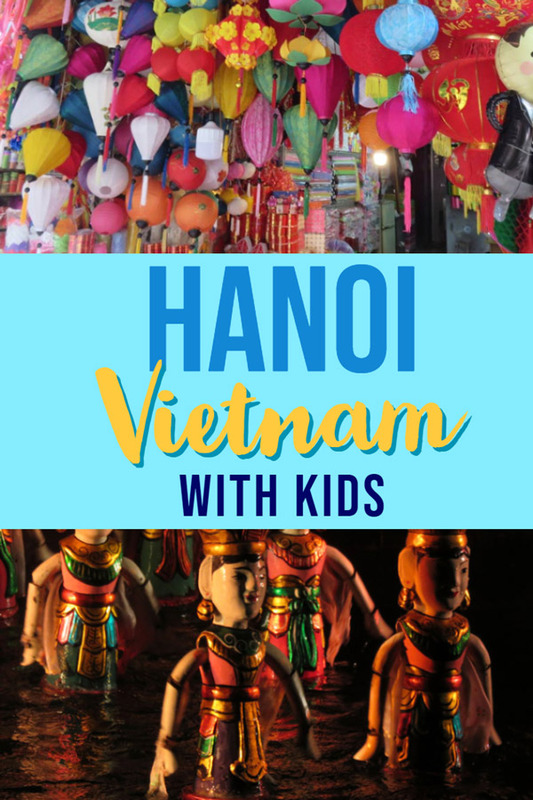 If you’re booking a family holiday to Vietnam, we have a detailed North-South itinerary for 21 days in Vietnam with kids including Ninh Binh, Hoi An, Hue and Ho Chi Minh City. Vietnam is a great country to explore with children of all ages. 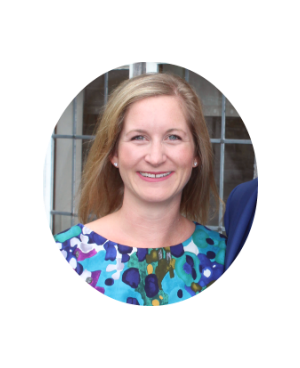 Kirsty is a British family travel blogger currently living in sunny Malaysia. She has travelled to over 100 countries including 20 with her young children. 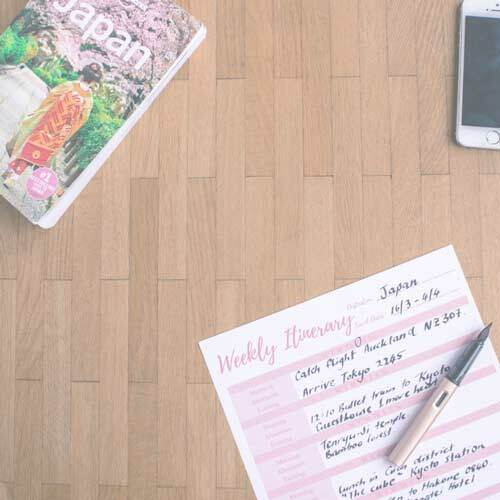 She blogs about family travel with a dash of feminism at World for a Girl. Her goal is to inspire girls to be fearless global adventurers. Follow her on Facebook, Pinterest and Twitter. 🗹 Hang out for a bit and check out another post on the blog. 🗹 Share this post on your favourite social media, in an email or whatsapp. 🗹 Leave a comment or ask a question.